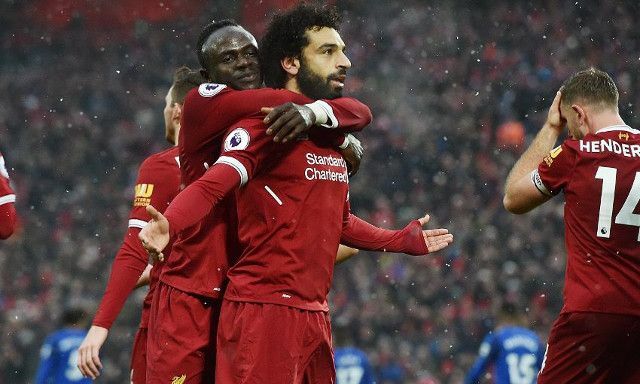 Gary Neville has urged Manchester United’s wingers to take inspiration from the movement of Mohamed Salah and Sadio Mane for Liverpool. The former United defender was full of admiration for the duo’s willingness to make bursting runs through the middle as part of the Reds’ interchanging attacking system. Anthony Martial played a starring role in United’s 2-2 draw with Chelsea at Stamford Bridge, scoring both of his side’s goals to supply another glimpse of his potential. Marcus Rashford meanwhile worked hard across from the Frenchman, leading to further calls for a greater goal-scoring threat from the Englishman. With both possessing experience in a central role, it seems only natural for there to be expectations of more eye-catching figures in the final-third. “They need more from the front three, there’s so much talent there,” Neville told Sky Sports. The threat of Salah and Mane in central areas and the subsequent spread of goals across the front three has been a key trait of Liverpool’s success under Jurgen Klopp. Though they are yet to offer the required conviction so far this season, both have persisted to mix their game up with diagonal runs in behind and deeper hold up play as a means of bringing those around them into play. Salah teased signs of rediscovering his form on Saturday as he ended his mini-drought with a clinical finish in the 1-0 win over Huddersfield.